The following information serves as a guide to help you in preparing for the reception of Sacraments at All Saints Parish. We are excited to be part of this beautiful opportunity for God's Special Grace and will work with you as you journey towards them. Baptism: Congratulations! We are so happy for your family as you welcome your child to become part of God's family of faith. Please click on the link below and fill out the form and return it to the parish office as instructed on the bottom of the form. If it is your first child, we will require that you watch a video explaining the symbols and what baptism is. The video can be mailed to you, along with a booklet explaining the Sacrament of Baptism. We will also send a booklet for the Godparents. Reminder that at least one Godparent must be a Confirmed Catholic. Most Baptisms take place during the weekend Masses. That we we all get a chance to join in welcoming the newest member of God's family! First Reconciliation: Classes are offered through our Faith Formation Program. At All Saints, children receive this Sacrament in 2nd Grade. Parents are involved as well through Reconciliation Learning Center, a special training with Father Schneider and the group celebration of Reconciliation. Home schooled preparation is also an option. Contact Father Schneider, Faith Formation Director Colleen Terrell or the parish office for more information. 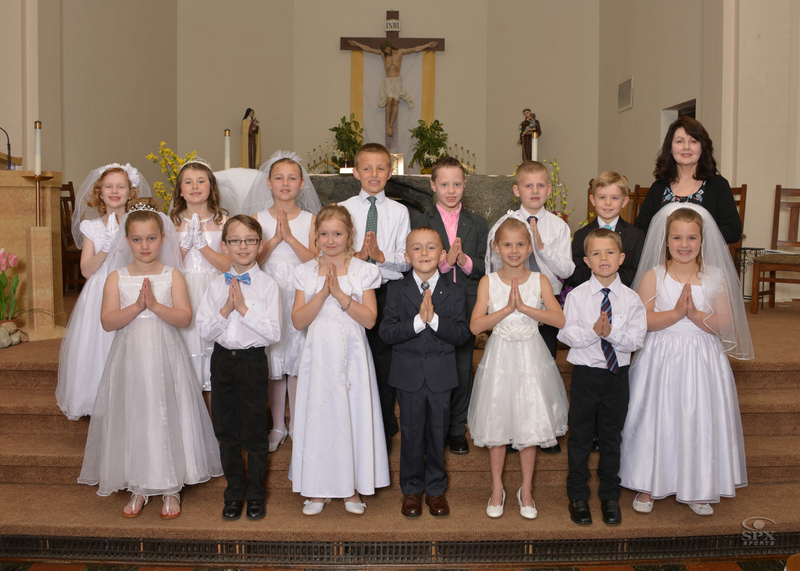 First Communion: This special Sacrament is also celebrated in 2nd Grade at All Saints. Classes are offered through our Faith Formation Program with a teacher and Father Schneider works with the families in preparation. A special time with parents and children involves learning centers, special learning time with Father Schneider, and a First Communion Banner making afternoon. First Communion is celebrated at a 10 a.m. Mass at the parish in the spring. Contact Father Schneider, Faith Formation Director Colleen Terrell or the parish office for more information. Home Schooling is also an option. If a family would like to have their child celebrate on another date other than with the group, please check with Father Schneider. Confirmation: Students prepare for the gift of a strengthening of the Holy Spirit through Confirmation in a special way through classes presented by Father Schneider in their junior year. They meet with their parents and/or sponsors for special sharing and discussion. Each student writes a letter to the bishop explaining how they have prepared, why they wish to be confirmed and what name they have chosen. The Sacrament is celebrated with Immaculate Conception Parish of St. Clair and the parishes of St. Ann's in Janesville and St. Joseph's in Waldorf. Faith Formation Director Colleen Terrell is in charge of this program. Marriage: We congratulate couples on their engagement and are happy to work with them in preparation for the Holy Sacrament of Matrimony! Arrangements for the date and preparations are made by contacting Fr. Schneider at least 9 months in advance. It is important that Father Schneider gets it on his calendar and that we do not have another activity scheduled in the church at the requested date! Father Schneider works with each couple to prepare them for a lifetime together celebrated with faith as a central element. Each couple will complete a Pre-marital inventory online. The results help couples to explore areas and communicate on important topics before the wedding. Father will also help couples to plan the actual wedding ceremony and Mass if there is one. RCIA: The Rite of Christian Initiation of Adults is the process where adults become members in the Catholic Church. Father Schneider works with candidates to help them understand the Catholic Faith through reading of various books and meeting with them for discussion and sharing information. Topics include: Catholic theology, God's incredible love for us, a review of the Catechism of the Catholic Church and more. For additional information, contact Fr. Schneider. Anointing of the Sick: The Sacrament of Anointing of the Sick is offered to anyone who is need of strengthening. It used to be that people only sought it once just when death seemed imminent. Now we understand that this precious gift of the the strengthening of the Holy Spirit is a great gift which can help us to heal and know God's love. If you would like to have Father visit you either in an emergency or in other times of suffering or weakness, please call his cell phone or email him. His information is on the front of every bulletin. Holy Orders: Have you ever thought that God might be calling you to serve as a priest? If you are considering such a vocation, please feel free to contact Father Schneider. He will be happy talk to you about it. In addition you can find information on the diocesan website - dow.org/offices/vocations. Father Will Thompson is the Diocesan Director of Vocations. He can be reached at 507-454-4643 or Wthompson@dow.org. The diocesan website has resources also for those considering a vocation to the religious life. Mass Intentions: If you would like to have a Mass said for the intention of a loved one, the cost if $5. Please contact your parish office to schedule it. Funeral Mass: In the event that you need to plan a funeral, call Father to schedule a funeral Mass. He will schedule a time to meet with your family, usually at the funeral home, and to make arrangements for the Mass of Resurrection or memorial service as the family wishes. He will help you select scripture readings, music, plan for a meal if you want to have one, and more. In the event that he is unavailable, Helen Peterson will meet with you and help in his place.